Dhaka, 11 Jan, Abnews: Lionel Messi's incredible rise from Argentina to Barcelona has been re-told in the most creative way imaginable - a pair of football boots. The 30-year-old has been presented with the incredible gift by a Paraguayan artist who was intent on illustrating his life story. Lili Cantero has been so inspired by Messi's life and achievements that he took the time to commemorate them by hand painting a sequence of his finest moments. The personal tale takes in his early childhood back in South American and then to posing for family snaps with his wife Antonella Roccuzzo and holding his children Thiago and Mateo. But his feats on a football pitch have also been depicted on the boots, with early snaps of him in action for Barcelona including an iconic image where he leaps on the back of former team-mate Ronaldinho. It also shows what has become a famous picture of his celebration in front of Real Madrid fans at the Bernabeu last season. Messi scored a last-minute winner in a 3-2 win at the home of Barca's arch-rivals and celebrated by showing the crowd his No 10 shirt. 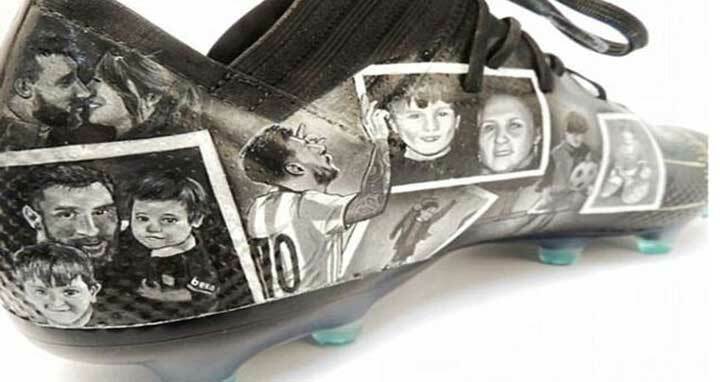 The artist revealed the inspiration behind the boots, explaining how Messi's hard work to reach the very top paid off: 'These boots were sent to Barcelona as a gift for the player, they are fully hand-painted. Messi isn't the first footballer to receive a pair of hand-painted boots from the talented artist.